A dining table that can serve as the centerpiece of any dining space's décor, the Waterloo Dining Table offers an awe-inspiring addition in any home. 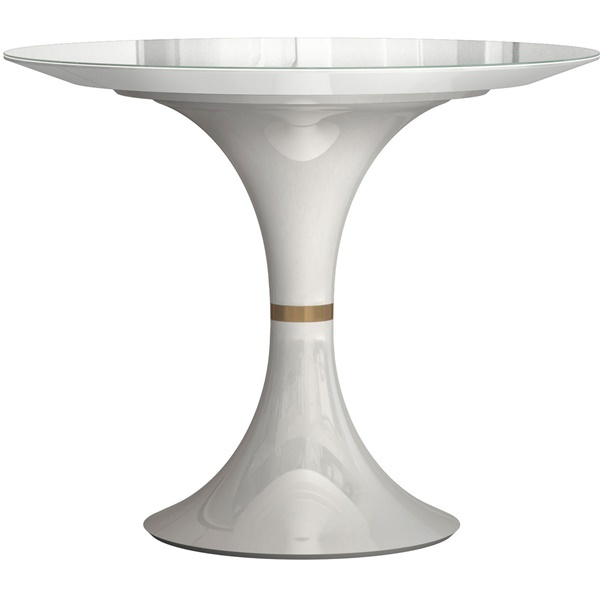 The dining table boasts a thin white glass top that ensures the table will sparkle consistently. Also, the dining table includes an industrial-grade, tulip-shaped fiberglass base that guarantees outstanding support. For a simple yet elegant dining table, you cannot go wrong with the Waterloo Dining Table. Thin white glass top gives the dining table an awe-inspiring look and feel. Industrial-grade, tulip-shaped fiberglass base offers superior strength and durability. Base is finished in a high-gloss white lacquer that ensures the piece will maintain its appearance for years to come. Simple yet elegant design helps the dining table make a bold statement in a modern or retro dining space. Available in multiple sizes to fit perfectly in any dining space.